Looking for Pressure Washing in Stanley, North Carolina? Is the siding of your building looking dull or faded? Is moss growing in areas that receive lots of shade? Call the Stanley power clean experts at Excel Pressure Washing for a fair estimate and watch how quickly we can transform your building's exterior. And more, just call (704) 228-6674 for a quote! Stanley Pressure Cleaning: The Economical Face Lift! Pressure washing your Stanley home or office is the most cost-effective way to revitalize its exterior. Over time, the exterior surface of your property becomes coated with dirt and pollen, making it look dingy and dull. It's amazing quickly and inexpensively Excel Pressure Washing can make a building look new again with pressure washing. When you power clean Stanley decks, siding and driveways will look clean and new after being pressure washed by Excel Pressure Washing. Our passion is beautifying buildings in Stanley with our power cleaning services! Call us at (704) 228-6674 to find out how inexpensive pressure washing services can be! The pressure washing crew at Excel Pressure Washing has years of experience with all types of pressure washing in Stanley. From roof cleaning to commercial properties, to fences and decks, we have learned the the most effective techniques and best products to perform each job each job cost-effectively. Using equipment with a PSI that is powerful but not overly aggressive, our powerful pressure washing tools will blast off dirt and mildew without damaging the surface and allow us to use less water and chemicals to complete each job. Call the Stanley power washers at (704) 228-6674 for a free quote today! 5★★★★★ - "Excellent and work and highly professional staff. Extremely responsive and detail oriented. Highly recommended." 5★★★★★ - "Ryan and the Excel team did an outstanding job on our facility. Very professional and had no problem working around our schedule. I would highly recommend Excel Pressure Washing services to anyone and they will definitely be my "Go-To" anytime I need a pressure washing service in the future." 5★★★★★ - "Ryan's team did an outstanding job pressure washing at my property just before listing. I wouldn't hesitate to recommend his services. I have used him on multiple occasions and never had any issues." 5★★★★★ - "The team did an awesome job pressure cleaning the house, roof, front porch, driveway and sidewalks and cleaning the gutters. Very competent, professional and courteous. The work exceeded my expectations and would definitely use them again." 5★★★★★ - "Ryan and his staff were so professional in every way. The crew was on time and the job that was done was exceptional! I tend to be a hard-to-please customer but I was so blown away with the results. We had a large area to steam power wash including concrete patios, walkways, and a long driveway, and the crew was very thorough and conscientious. 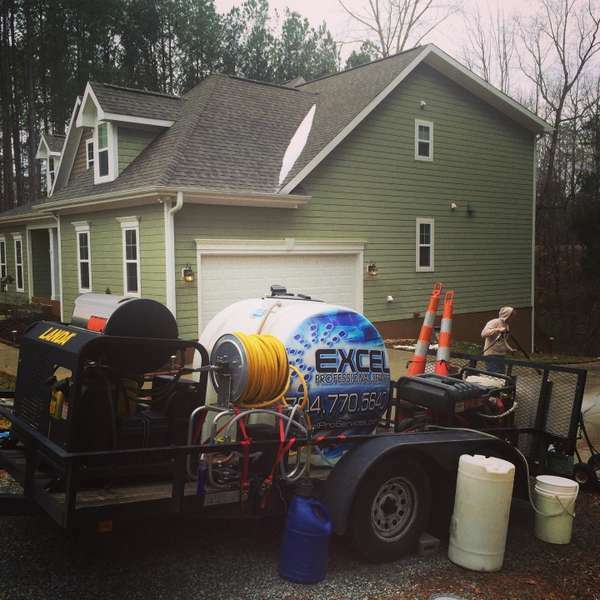 Would definitely recommend Ryan and Excel Pressure Washing to anyone who is looking for an exceptional service provider with a strong work ethic....which in these days seems to be a novel concept." 5★★★★★ - "The work is looking incredible! I had to snap a before and after shot as I wasn't expecting this much of a difference. Instead of getting just 1-2 years extra life out of the fence, I am going to replace a few boards, install a few deck screws in weak areas, and my fence will be good as new! You guys do great work!" 5★★★★★ - "Excel Team did an excellent job power washing my house, driveway, patio, windows, etc. Crew went above and beyond to make everything sparkle!!" 5★★★★★ - "Pressure washed my metal roof. Great job, without any problems. Everything exactly as promised." 5★★★★★ - "I was able to quickly receive a fair quote and schedule my service in less than a week. I am extremely pleased with how clean our house, roof, gutters, driveway, patio, and sidewalks look! I thought we would have to repaint our screened in patio but after the thorough power washing, we no longer have too! We will be using them again in the future!" 5★★★★★ - "This has got to be one of the best companies if you need anything pressure washed or stained. The pressure washing crew was not only prompt, they worked quickly and effectively while being very responsive to anything that was needed. The crew that came out to stain the fence taped off everything that could have got spray on it (hinges, locks, and even weather station), along with going out of their way to make sure no over-spray went on the grass or onto anything else including the neighbors yard. They even went around and made sure the fence was painted all the way to the ground (so a bunch of detailing work to make sure no spaces were missed). If you are looking for a company that is quick to respond, do an amazing job, and not cost a fortune, then this is the one for you." 5★★★★★ - "Our Property Management group has used Excel Professional Services for years in and around the greater Charlotte, NC metro area. We are a large group with multiple commercial properties. Excel Pressure Washing maintains all the building exterior cleaning & washing services like sidewalks, building exterior surfaces, window cleaning etc. They have worked at over 15 properties and are always very responsive / on-time with great results and communication every-time!! They do such good washing & cleaning of our properties that I had them clean my house too - pressure washing house, driveway, sidewalks, pool deck surface cleaning & gutter cleaning. My wife and I could not be more pleased with our house now it shines. Thanks again as always!!" 5★★★★★ - "On time, very professional and excellent customer service! They did a great job power washing our house, our driveway and our porch. I highly recommend the team at Excel!" 5★★★★★ - "We hired Excel to clean the exterior of our home, drive, and sidewalks. They provided a high quality service and were very responsive and courteous. We will definitely call on them in the future." 5★★★★★ - "They were very prompt and had very good communication throughout the services they provided. Very professional staff at the office and of course their employees too. Employees were really great and very understanding. They even stain couple of fences at no charge even though it was in the initial contract because they had some stain left. I would highly recommend and definitely using them again." 5★★★★★ - "Excellent! Workers were on-time, courteous and ensured my satisfaction before leaving. I'd recommend them anytime." 5★★★★★ - "full service power wash and gutter cleaning"
5★★★★★ - "We used Excel to wash both our roof and driveway. In both cases, the work was done professionally and we were very happy with the price. I highly recommend them. They cleaned a roof streaked with tree sap and a driveway that had been neglected for seven years. In both cases, they made the surface look new." 5★★★★★ - "Excellent job! Beautiful, quality work for a great price." 5★★★★★ - "Excellent work. Timely arrival, cleaning of roof was excellent, and no shrub damage from the washing." 5★★★★★ - "Reasonably priced, very responsive, knowledgeable, and professional. A++ on communication! They take time to explain, if needed.They clean up after the job like they were never here. Highly recommend!" 5★★★★★ - "The Excel men showed up when they said, told us what they were going to do and did an excellent job...even more than we expected. The house looks great. Very Professional!" 5★★★★★ - "They did a great job cleaning out our gutters. Very professional, at a very reasonable price. Will absolutely continue to use their services." 5★★★★★ - "I have used Excel twice in the last year and both times were a positive experience. They have good communication and do a great job! I will use them again for sure." 5★★★★★ - "Excel Professional Services is truly committed to serving their customers well. They do excellent work. We're very pleased with the service we received and will use their service again." Your guys were here yesterday, as promised, and I wanted to tell you what a great job they did! You were very responsive to me and did everything you promised and on time!! 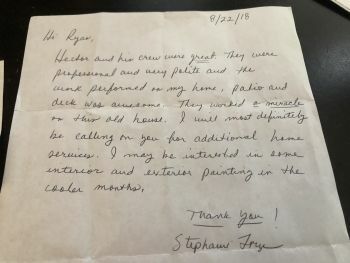 I cannot tell you how many home improvement companies we have worked with lately that do not even show up or are unresponsive to calls or emails. I would gladly recommend your company to neighbors and friends and would certainly use your services again." 5★★★★★ - "Excel services are outstanding. Ryan was extremely professional throughout the process. We had our very large two story roof cleaned and the Excel crew took great care to ensure everything was done safely. Our roof looks like new! We are very pleased." 5★★★★★ - "Quick response for service. Cleaned our gutters, left our property clean, and took the debris with them. Thanked us for the opportunity to do the work and ask if they could be of any further service." 5★★★★★ - "I had my gutters cleaned, they did a great job and I would use their service again." 5★★★★★ - "Ryan and team are excellent and approach everything with a high level of professionalism. They were able to get to us quickly and the work was completed to perfection! I will continue using Excel Pro Services to keep our external surfaces squeaky clean. Amazing!" 5★★★★★ - "For the last two years we have had Jeremy and Crew clean and repair gutters and pressure wash the house. Their professionalism and quality of work is simply the best. See you all again next year." 5★★★★★ - "EPS crew was wonderful- professional and prompt communication and work! Will absolutely use them again. Highly recommend." 5★★★★★ - "Was given a job well done! The reps pointed out some things (that I could not see) from a previous incomplete job and recommended a follow-up svc. They also went to reaching out to better satisfy my specific needs as well as complimenting me on being hospitable & making them feel comfortable. I'd expect the same, if I were a contractor (as I am), on a job!" 5★★★★★ - "Professionalism at its best! From day one when I received my quote, through regular follow up with scheduling, to conducting a fantastic job it was through and through professional. I couldn't have asked for more from Jeremy and his team. I would highly recommend. You won't be dissatisfied with their service." 5★★★★★ - "Jeremy and the guys did an amazing job. We needed new shielded gutters and extensive repair to our exterior wood surfaces. Jeremy came out and quoted the job, and Victor performed the repair without me having to take off work to be present. Great job!" 5★★★★★ - "Company did a great job. They were quick to schedule and get the job done. Pleased with their services and would use them again." 5★★★★★ - "Excel Pressure Washing did an amazing job at my senior apartment building. It was time for a face lift. Jeremy and Carolina worked together so well as a team getting the job done. Would definitely recommend them." 5★★★★★ - "I can't say enough about the hardwork, professionalism and diligence that Jeremy, Ryan and the entire team at Excel provide as a service to their clients. We have used them for several years - everything from exterior painting, deck staining, window washing and pressure washing. These guys are the best....look no further." 5★★★★★ - "Excellent service! Saving their information to use again"
5★★★★★ - "our roof looks new, and the front porch and deck sparkle! great job!" 5★★★★★ - "They were very prompt and very good communication throughout the services they provided. Very professional staff at the office and of course their employees too. Employees were really great and very understanding. They even stain couple of fences at no charge even though it was in the initial contract because they had some stain left. I would highly recommend and will definitely use them again." 5★★★★★ - "Excel cleaned our gutters, pressure washed our driveway and sidewalks, and removed mold from our stucco. The team was punctual and professional. The work was done in the time that I was told in advance and at a fair price." 5★★★★★ - "Thank you for your service and professionalism. Very good job!" This is just a quick note to express my pleasure with the service received today. The crew who came out to clean the gutters were very helpful, pleasant, and hard working. They did a great job! Given this great experience, I have referred Excel Pro Services to my neighbors! I will definitely be scheduling recurring maintenance with you. Thanks again, Pegie"